Revolutionize the way kids drink from bottles! Designing products for children is very exciting. They are very demanding and challenging! They bring joy and fun to everything in life. Yet when they find something they like, they are very eager and enthusiastic about it. A child's smile is the best reward! When it comes to beverages, kids are always curious of trying new ways to drink. Of course parents look for systems that are safe and clean, but kids enjoy convenience and fun. A leader of the beverage packaging industry is looking to innovate in this field and needs your help to create the next big drinking hit for kids. Design a new “dispensing system” (i.e. the interface between bottle and drinker that dispenses the liquid) that will bring kids aged 4 to 11 a totally new drinking experience. 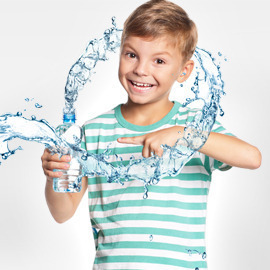 Invent a breakthrough “dispensing system” for water or juices that changes the way kids between 4 and 11 drink – to make the experience fun and fresh. Observe kids, get creative and send us your innovative revolutionary ideas by July 20, 2014 23:59 UTC! Good luck!